As the first stage of the Palestinian-Shalit prisoner swap deal took place on Tuesday morning, families of the some of the 40 prisoners to be exiled to Turkey, Syria and Qatar were waiting at the border crossing between Egypt and Israel. The families had gathered from the early hours of the morning in order to meet their loved ones, many of whom had been inside Israeli jails for years. However, their hopes were dashed when the buses crossed into Egypt without stopping. Under the deal, 133 Palestinians from Gaza, 117 from the West Bank, and 15 from East Jerusalem will return to their homes, although some will face security restrictions, according to AFP. 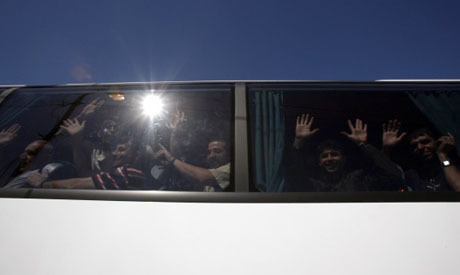 Another 163 detainees will be exiled to Gaza, although 18 of them will be able to return home after three years. Another 40 are being exiled to Turkey, Syria and Qatar, Hamas officials said, while seven Arab Israelis will be sent home, and one Palestinian with Jordanian nationality will be sent to Jordan. Two female prisoners have protested their planned deportation to Qatar and are determined to reside in their hometown of Gaza. Moussa Abu Marzouk, deputy leader of Hamas, was present at the border, as were a number of Egyptian officials who were supervising the operation. On the Israeli side of the border, President Benjamin Netanyahu and Ehud Barak were reported to be waiting in an office watching the operation via video link. A small press conference was held by Abu Marzouk after the completion of the deal. He stood alongside weeping relatives who did not get a chance to meet the released prisoners due to harsh security measures imposed by Israel. Speaking to Ahram Online, Abu Marzouk expressed his appreciation to Egypt and the other parties that oversaw the deal in coordination with the Israeli authorities. He added that the resistance had secured a victory over Israel because the movement had refused to succumb to threats. Despite continued attempts by the occupation forces to punish the Palestinians for the kidnapping of Shalit, the Israeli authorities had in the end given in to Hamas’s demands. The deal is one of many forms of resistance taken by the movement, added Abu Marzouk. However, many issues remain, such as ending the occupation, halting the encroachment of Israeli settlements in Jerusalem and freeing the remaining Palestinian prisoners in Israeli jails. A second group of 550 prisoners is to be released over the next two months although the names have yet to be decided.